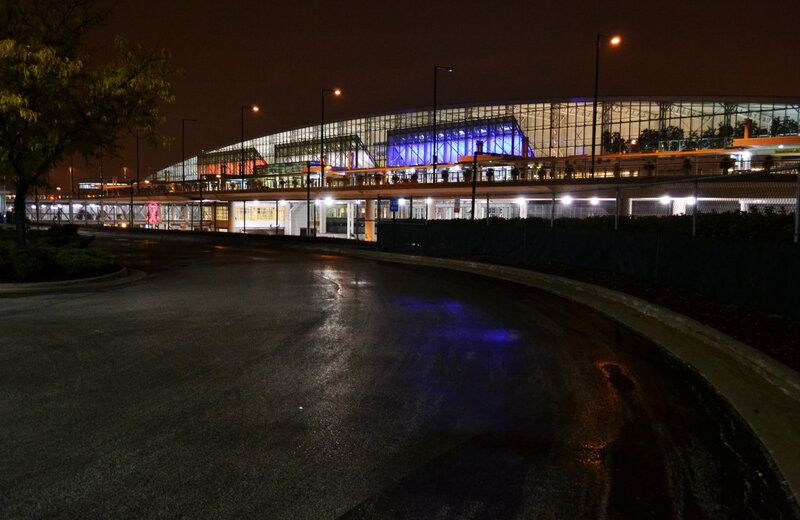 One of the busiest airports in the world, O’Hare International Airport has both strong domestic and international presences. 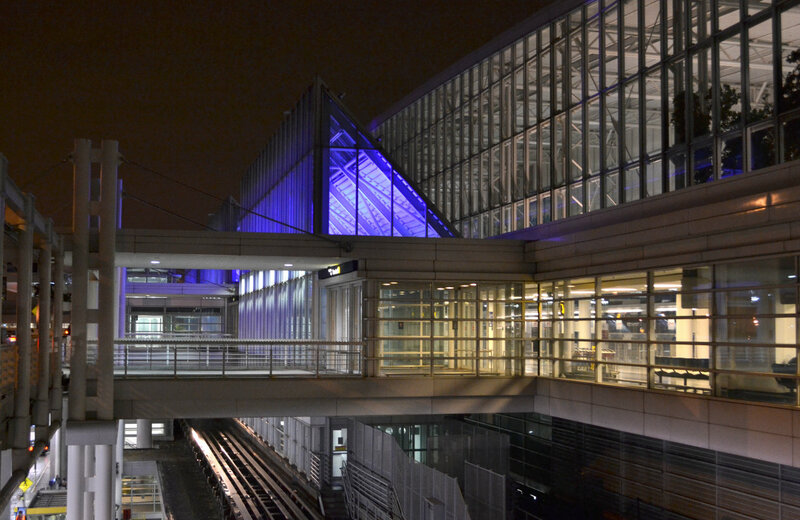 In 2011, as part of an effort to add modern character and flair to its international Terminal 5, Traxon & e:cue’s intelligent LED lighting and control components were installed in large bays over the airport’s automated inter-terminal Airport Transit System. Aimed upward at the angled, architecturally-textured ceiling opposite large panes of glass, Traxon’s ultra-bright Wall Washer XB-36 RGBs produce an even, saturated wash, which dramatically changes the environment and can be enjoyed by travelers as they board the train. Due to the fixtures’ high intensity, the colorful illumination can also be seen outside at great distances, including along the long roadway leading to the airport and from the passing interstate. 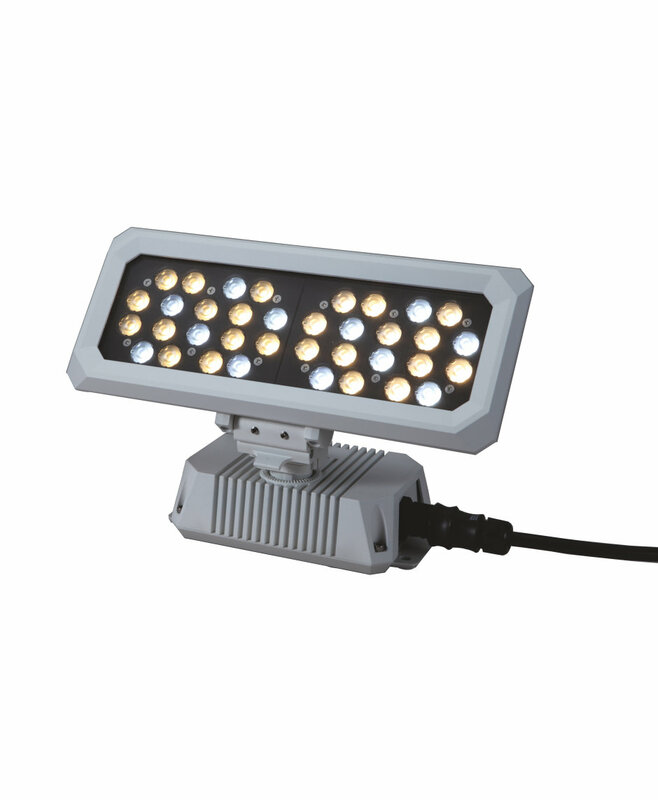 The powerful fixtures are paired with a Butler XT control engine, which is programmed to deliver static color schemes for seasonal changes, holidays, and various special events, such as red, white, and blue for Independence Day, red and green for the winter holidays, and pink for Breast Cancer Awareness Month. The control system is paired with a Glass Touch T12 for easy scene changes on the spot. With the assistance of the Butler XT’s internal astronomical clock, the installation is triggered to automatically power on at dusk and power down later in the evening when much of the typical daily traffic has subsided. 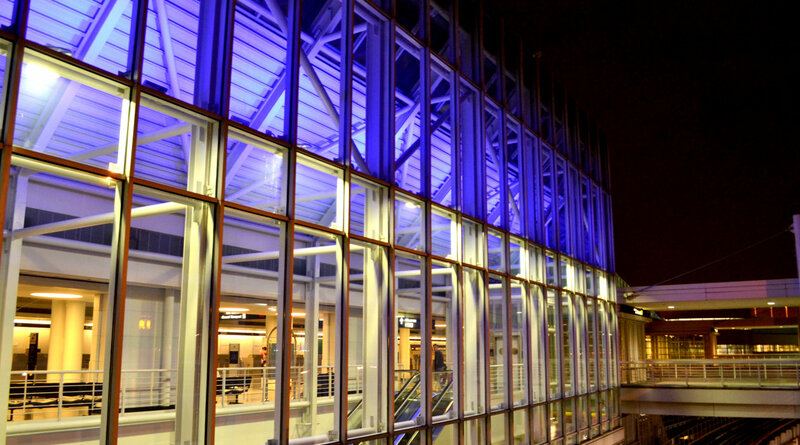 The addition of this bright, bold illumination to Terminal 5 is experienced by all airport guests arriving, departing, and transitioning through O’Hare’s international terminal, and helps to celebrate seasons and maintain a strong presence on the interior, as well as the exterior of this busy airport.